Greetings! Thank you very much for the interview. I hope that the readers will be able to know a little bit more about your band and about yourself as well. First, I kindly ask you to introduce yourself. M – Hello! And thank you too, Markus. My name is Max Shtanke and I am a singer and the guitar-player of the melodic death metal band Black October, and as you already know – the singer of Alkonost. 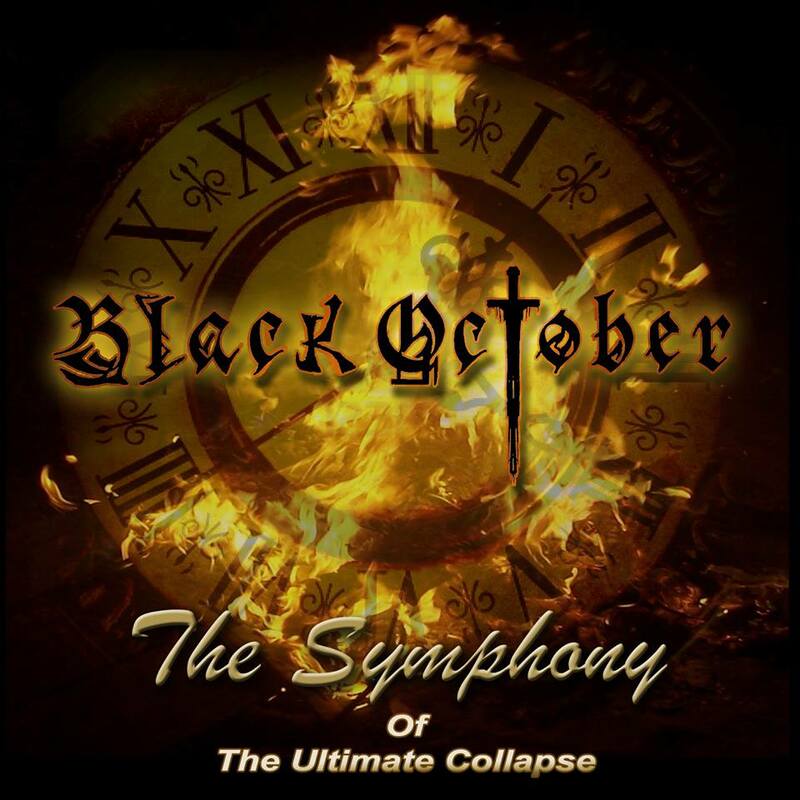 Well, as this is the first interview that I’m conducting with you, as Black October, since I’ve already discussed Alkonost with two other members, I’ll ask a few ‘basic” questions in order that those that aren’t familiar with this band will get to know it more detailed. Please, tell us the history of Black October, why did you decide to create this band and why the band was named Black October? M – At first we gathered just to play music, it was in the early 2000s. We played everything we liked, it was cool. At that period, internet was not so available as now, and because of such things, as music, rehearsals, and shows, we had interesting acquaintances, we hang out, we exchanged music, many positive and bright memories of the beginning of my musical path that will remain with me forever. The band name is most likely the date of the first concert. As I remember it was the end of October, and “Black” because we were creating very dark lyrics at that period. But as Melodic Death Metal band we have been playing only since 2006. And I guess that year is a kind of the beginning of Black October. We really liked this genre, and people who come to our concerts “fall in love” with a new material, they spank to the scene and make slam and so on, that sometimes pissed the security and administration off. So we even made a couple of CDs: «Bootleg 2006» and «The Flesh Of Forest Crucified 2008″ that automatically received good comments. The only one thing that made us upset was the recording quality of our material. But we liked MDM very much and we continued to develop in this direction. What was the reason that the band decide to create the lyrics in English? Was it because you aimed a bigger market or that you feel that the lyrics of this band would “sound better” in English? 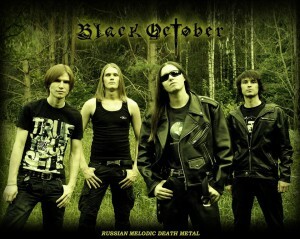 I saw that you Black October is considerably more popular in Russia, how did the Russian metal listeners react to this? I personally really liked what I heard and hope that the band will be more recognized around the world. M – I doubt that the aiming on big market depends so much on the choice of language, Arkona sings in Russian, and has performed all over the world. Let’s start with the fact that in the beginning our songs were in Russian. But the fact that the music, which is of European or American schools, did not sound in Russian. Absolutely. That’s why, all the lyrics I had to be rewritten into English. And as far as I was amazed how it sounded pretty cool as it should be. And of course I would be very pleased that the material did not have a language barrier with the rest of the world. I think you’re familiar with the fact that in each country there are three categories of people: 1) Those who prefer the bands singing in their native language irrespective of what kind of music they play 2) Those who distinguish music genres and understand where one or the another language is more suitable: Russian, English, or maybe other. 3) Those who don’t care about the language, as I understand, they just listen to the music. And perhaps there is another type who prefers only foreign lyrics in any way, but I haven’t met such people. So I am in the second group. This is a frequently asked question, “Why not in Russian?”, But generally fans support it. Those who prefer English-language lyrics more are in majority. In a way connected to the previous question, I wanted to ask you what the band generally sings about. And what about the composition process, how does it work for Black October? You might have, in some way, already answered it, but I’d like to know if the lyrics or the music come first, if the band members get together to work on a song or do you all work individually? M – The songs basically describe the nowadays and future world in the light of post-apocalypses and rise of some new worlds. It the lyrics we reflect about themes as Romance (Remaining in Darkness), the other realities (The Other Side Of Midnight), dreams (Dreams Shall Burn) and achievement (Finally Victory). Generally I am the main composer, the second guitar-player Vitek Buznaev helps me, but more like a sound producer, we have a lot of burning ideas for new records. Generally the songs come in very different ways: sometimes poems, sometimes the music comes first, sometimes all at once. It’s like the river floats, all should come right from the heart. 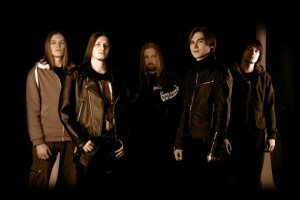 It’s stated that your music is recommended to fans of Norther, Arch Enemy and Children Of Bodom. In your opinion, not considering Norther, as they’ve split-out, do you feel that these bands still release great albums such as the classic ones, as Something Wild, Hatebreeder, Follow the Reaper or Wages of Sin? I remember when I first heard Hatebreeder in 1999/2000 and I was blow away, but, somehow, in my humble opinion, of course, the “big names” have lost a bit of touch and more underground ones keep the legacy that they created. What do you think about this? M – It was stated very in a very generalized way there. I can not say anything bad about a new Children Of Bodom album, the guys make their music, they still have a branded chorus, solos. But of course I like the old albums better. There were more interesting riffs and melodies. Every song was a masterpiece. Arch Enemy’s new album sounds pretty good, frankly, I haven’t listened to the end yet, but the melodies are very good, and Alissa burns there as hell. The problem with illegal downloads and bootlegging is a worldwide issue, but we see this happen quite often in Russia. Why do you think this happens so much in there and also, what are the measures that you think that should be taken against this? Or do you think that it doesn’t really matter and you prefer to rely on concerts? М – This would not be such a big problem if people bought CDs at least in small quantities, but now in Russia (I hope not in the whole world) people don’t buy CDs at all, especially if the band isn’t so widely known. So yes, it is a problem. It’s not the question of the money spent on the recording of the album, advertising, releasing CDs, etc., which of course, we want at least to be partially return back with sales our album. The problem is that this situation shows that the albums releases are useless. It’s for elected people, or something like this. Maybe we need to release a very small quantity in the form of the premium edition digi-book + vinyl + some kind of merchandise. Also connected to the precedent inquiry, how do you feel is the Russian underground nowadays? Of course I am aware that the country is huge, but do you feel that there’s cooperation among the bands, be them about the same or different regions? And concerts promotion, how well do you think they’re organized? M – Yes, we have a good cooperation with some bands from completely different regions (Troll Bends Fir, Chimera, Arkona, Ruyan, Emerald Night, etc). Now the concerts sound good. In the past the sound was the main problem, the main problem for now is the almost empty hall. In early 2000 people just wildly spanked in large numbers to listen to any show with a horrible sound. The promotion of the show depends on case, sometimes it can be 80-level (it’s a slang, means “very good” I guess you know), sometimes it absolutely absent. I’d like, please, to ask you about your musical backgrounds. When did you start to play instruments and sing? What lead you to this as well as the musicians that have influenced you? Why drew your attention to metal? M – Well, this has been with me since early childhood, I remember when I was a little boy we haven’t any musical instrument in our house, and when my parents came to visit some neighbors or so, they took me. If there was a piano, guitar or even any musical instrument, I ask to play or something like this, and if they didn’t allow to do it, I became particularly unhappy, sometimes they allowed to play, then I stayed busy with it while parents were communicating, it could be ‘till late evening or even night. Of course, at that time, I was just experimenting because I wasn’t able to play, but I liked it, it is the fact. It wasn’t any metal in the beginning. I was listening to totally different music, but it really wasn’t even rock. Metal began for me when I lived in Moscow. Once I bought a T-shirt and bands tape named Metallica. I remember when I put it in my cassette player, and It began: “Ta-ta-ta” three first chord composition “whiskey in the jar”. I was so pleased and shocked with the sound of their guitars, I thought then, hell yes – THIS IS THE MUSIC! Then I bought their first studio album “kill ’em all”, and then I was “ofigel” talking in Russian (it means something like “very pleasantly surprised”). Damn! It is awesome! Then more and more… A little later, about a year, I thought – I will play this kind of music too. Besides this one, I can say that some influences I had from Megadeth, Sepultura, Slayer, Cryptopsy, and I still don’t exactly understand why – The Offspring, probably because a lot of friends loved them at that time. I always ask something different or personal and now it’s a personal question for myself, hehe. I’m planning to visit Russia soon (a dream come true, as I have a fascination over the nation and Eastern Europe) and, in your region, what are the main places that a tourist shouldn’t miss at all? I know it’s easier to google, but it’s always better to “hear” from a local person. M – I think I am not the first one who says that first of all it is St. Petersburg. I fell in love with this city immediately. Very nice, and I feel differently there than in other cities. One of the main historical and cultural centers of the country. Well, also the capital – Moscow: Red Square, museums and so on. There are beautiful places in the Urals, here I mean beautiful nature. It is near the city of Chelyabinsk. In general, a lot of places, hard to say, but the first place I would go to is St. Petersburg. And the personal question about yourself now, please, share with us some of your main passions, it might be about movies, travelling, some of your hobbies, if you have any, your favorite activities when not playing music. Tell us some of the goals you have concerning music. M – Well, I really like to spend time outside the city, any forests, you know. I love to cook national food of very different countries as much as possible, that is something new when I have a time. Recently I brought from Moscow a recipe of pasta with seafood (shrimps and calamari), we played in Moscow, and Serge from Emerald Night and his wife regaled us when we visit them. When I returned home, I decided to cook it by myself in the same week. Movies – yes. Previously, it was mostly thrillers and horror, in particular the old classic movies Lucio Fulci zombie horrors, and many different directors, including the underground, with whom I was introduced by my friend Telman, who is also a musician. Now I look with pleasure various genres, the main thing is that the plot should be interesting. I have a lot of music ideas, the other question how to make it right. The first thing is to finish all the planned releases, including new Depressive Black Metal album of “White Midnight” project. Make them a worthy presentation. To sign a contract with a big foreign label would be the highlight. 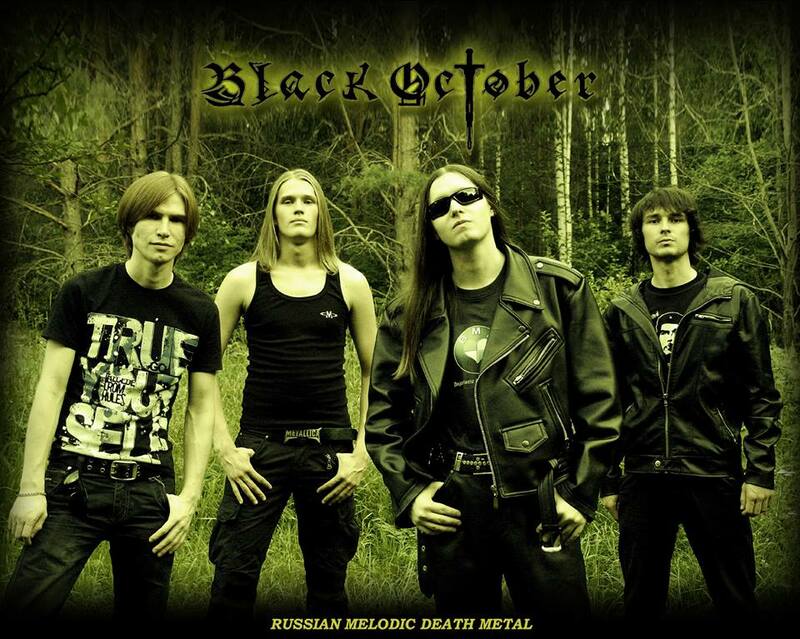 What do you think the future holds for Black October? And what do you wish that will happen in the future with the band? M – We don’t quite know how the events will be developing. 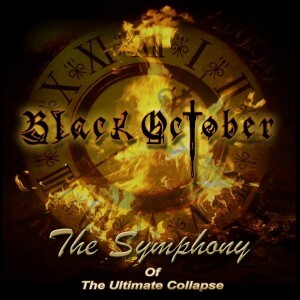 We released an album «The Symphony of the Ultimate Collapse» on Graillight prod. a month ago, so if you want to know us better, welcome, as they say. More over we have almost finished the material for a new album, just need to finish the lyrics. It would be desirable that this genre of heavy metal music was such wildly spread as folk metal nowadays, then we would have more releases and festivals here would consist of black metal, death metal and so on. And for the present all principle scene is only in Europe. I think if it happened so that we played on the big fest in Europe with the monsters of our genre at one stage I would be incredibly happy. We’ve reached the end of this interview. Thank you very much one more time for the answers and I wish you and the band the best. Any last words for our readers? M – Yes, it was great to talk with you, thank you for the conversation. I would like to wish everyone boundless happiness. Listen to metal, and support us, we need your support now more than ever! And thanks for reading this!